This blog is now on the Eastern Time Zone. I’m moving to New York. My new Congresswoman is Yvette Clarke. I have a great deal of love for Chicago, where I’ve been for the past 13 years, and the Midwest, where I’ve been essentially my entire life. In the Internet era, one can cover American politics from almost anywhere: some extremely talented writers do it from places like Brazil and Mexico. 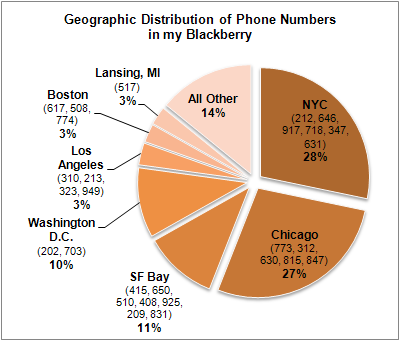 Nevertheless, as I’ve watched the number of 212 and 646 area codes proliferate in my Blackberry (see incredibly dorky chart below), and become intimately familiar with the concession stands at LaGuardia Airport (avoid the Wendy’s by Terminal D), I’ve realized that there’s an if-you-can’t-beat-’em, join-’em quality to New York City — and I’ve decided to join ’em. All right, truth be told, the decision isn’t nearly as scientific as all of that. I love cities — their intrinsic vitality, their polyphony of cultures, their food (!) — and as a lover of cities, I’d feel stupid if I were lying on my deathbed and hadn’t lived in New York for at least a couple of years. As a result of this, posting volumes are going to be a little bit light over the next few days, although Sean (who sold out and moved to Washington D.C. in January) and Andrew (who already lives in New York) should keep things moving relatively smoothly. In the meantime, Go Green!, and things should be more or less back to normal by the end of the week.